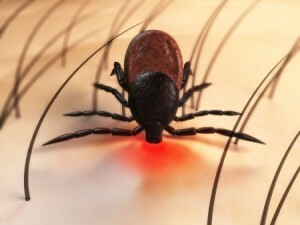 Tick bites can lead to serious infections, such as Lyme disease. And these diseases are something that you absolutely want to protect your family from. Bug diseases are never fun and you don't want them to stop you from enjoying your favorite outdoor activities. So, how do you actually prevent these diseases? Well, the best defense against tick-related disease is reducing your likelihood of exposure. Walk in the middle of trails while hiking. During the warmer months, you don't want to be stopped from hiking and enjoying the outdoors. And a fear of ticks shouldn't stop you from doing so. The trick is to stay on the middle of the trails and avoid tall, grassy areas where ticks like to hang out. Use a repellent. Sometimes using an insect repellent can be stinky and sticky. However, it is important to have some sort of protection on you when you're enjoying some outdoor activities. There are many different options for insect repellents, some of which aren't even sticky or smelly! Just find one that's right for you. Wash up after a day outside. As soon as possible, you should take a bath or shower to make sure you are free from ticks. It's best to bathe within two hours of your outdoor activity. But this really shouldn't be too big of a problem anyway, because who really waits more than two hours after hiking, biking or camping? Use mirrors to check for pests. When you've been in environments likely to contain ticks, it's important to do a full-body check to make sure you are free from any hitchhikers. Having someone check your body for ticks is always a good idea, but if you don't have that option, just use a mirror! Inspect pets and equipment. Ticks are just as likely to latch onto to pets and equipment as they are to people. They can easily ride home with you on those things and then latch onto you later. So it's very important to check your pets and/or equipment for any ticks that may have attached there during your time outside. Remember, it's always better to be safe than sorry. Here's to a safe summer!